Customers once concerned about lead in potable water can now rest assured using the SM Series lead free ball valve packages. The full port design of the lead free ball valve ensures maximum flow rates and is available in ½” inch through 2” NPT (National Pipe Thread). For those using multiple size valves in their piping system, the need to stock spare actuators of different sizes has been eliminated. One size actuator fits all valve sizes ½” through 2” NPT. SM series valve packages are compact, allowing for maximum space savings in tight locations. The SM series motorized brass ball valves are ideal for Residential, HVAC, and industrial on/off applications. 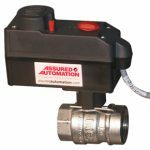 The quarter turn ball valve features a unique direct mount system that allows for extremely quick and easy actuator mounting, allowing for easy removal or replacement of compact electric actuator. Pre-wired with a cable lead eliminates the need for opening the actuator and wiring in the field. Users who require Manual override for emergency operation of the valve require no special tools, just a standard screwdriver to switch to manual operation and wrench to rotate the valve (on/off actuators only). All valves can be manually operated with a large screwdriver when the actuator is removed. Unique Clip Mounting: Simple, single clip-pin actuator mounting system offers outstanding stability and eliminates the cost, weight, and installation time required by other valve/actuator mounting systems that require brackets and multiple fasteners. 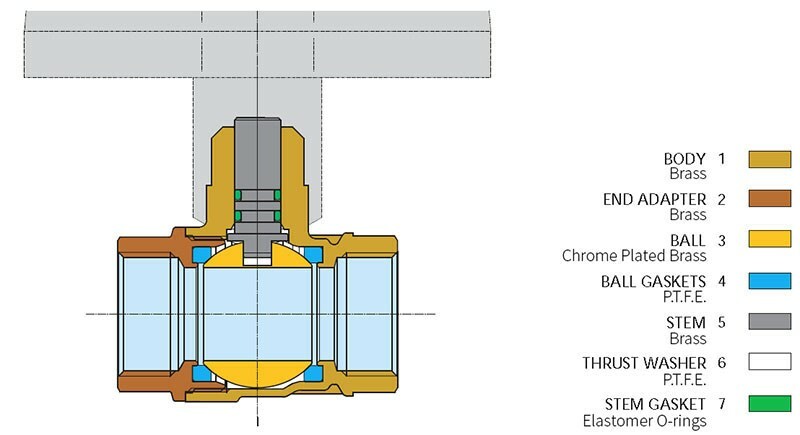 Compact Tight Shut Off Design: The graphic below shows the cross section of the SM series valve with double O-Ring design and PTFE seats and seals. In addition two internal limit switches (0° and 90°) are included to indicate fully open and fully closed position, and include a visual position indicator. This entry was posted in Latest News and tagged actuated brass ball valves, HVAC valve, lead free ball valve, motorized flow control ball valves, on/off valve. Bookmark the permalink.